Food and drinks. Please note this is not a tour about drinking (though drinks are OK). Booze is not a cultural mainstay here: Going out at night, walking around, cafe & restaurant hopping, people-watching, enjoying outstanding food and ending the night with some treat (much later and somewhere else) are! Upon request, your guide will pick you up in the lobby of your downtown hotel. Otherwise, meet at a specified downtown location. Meet your private guide at your hotel or at the Filippo Café to kick off your night, depending on where you are staying. Head to a popular local restaurant at the suggestion of your guide for a meal of traditional Argentinian fare. Sample empanadas, locro, and carbonada (two types of Argentine stew) or the available vegetarian options. Enjoy local beer with dinner while your guide fills you in on the cultural history and importance of the traditional Argentine dishes. If you wish to order beef or drink wine with dinner, the additional cost is your own expense. 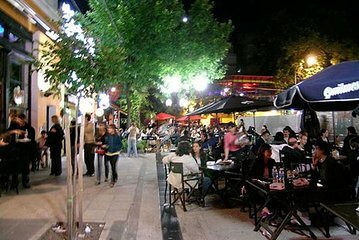 After dinner, hop into your private car and travel to one of Buenos Aires' lively neighborhoods like La Placita, Palermo Soho, Puerto Madero, or Reconquista. Enjoy an evening walk with your guide, which could include a visit to the polo fields, tango-centric Dorrego Square in San Telmo, or a stroll among Recoleta's mansions. Learn about the cultural habits and proclivities of typical porteños as you explore the city streets. Finish your tour with a traditional treat like tea, ice cream, or a nightcap at a local establishment. End your evening excursion with drop-off at your hotel. Our evening tour with Soledad, started by walking around the downtown, then to an Empanadas Restaurant for the best empanadas ever! Next we went to watch tango at her tango club. What a treat a more than memorable time, we LOVED this "tour". Highly recommend this experience. Once in a life time. I did this tour on the same day, as I did,the all day walking day tour with the same guide, Carlos. I highly recommend this tour as well as the day walking tour for solo business travellers with limited sightseeing time but who want to see a side of Buenos Aires hidden during the day - the night, when the city really comes out to play. Carlos made sure that we covered fresh ground that did not duplicate what we saw during the walking day tour. An accidental highlight of the tour was passing through the end of an Argentinian church wedding at 10pm, where everyone other than us was dressed up in black tie and cocktail gowns, ready to party all night. If only they planned weddings like that back home! Fabulous way of seeing Buenos Aires. Our guide turned up with no car or driver but we went around by taxi which was included in the price. We went to lots of places we would not consider visiting on our own, especially at night. Our guide was informative and planned the route around us. We went to Puerto Madera and walked along the waterside and canals. We would really recommend this tour for anyone who wants to experience more of this vibrant city than just the normal tourist sights. We really enjoyed it.